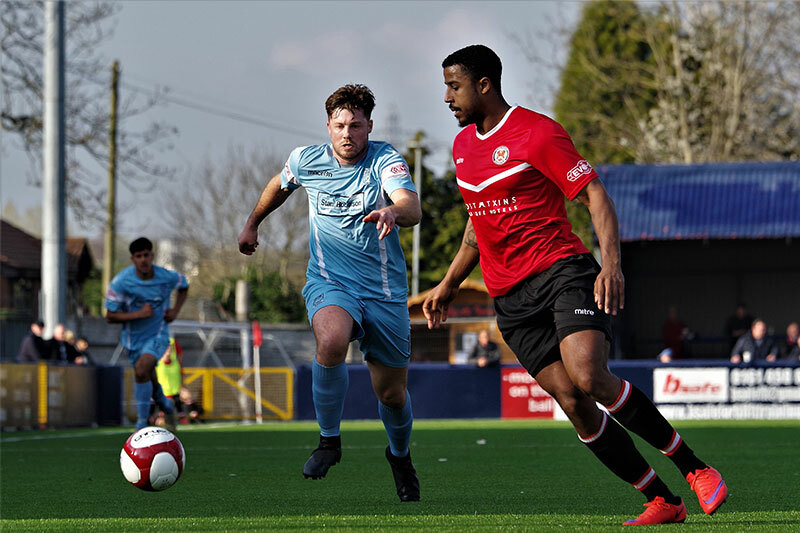 Stafford Rangers’ unbeaten run came to an end in an 8-goal thriller at Hyde United. Stafford were without Paul Bignot who was still nursing the foot injury picked up in last week’s draw with Warrington Town, which meant a recall for Sam Coulson who slotted in at right back. But Coulson had a tough time against Hyde youngster Paddy Lane and appeared to be struggling with a calf injury from the midway point, but by that time Rangers were already two goals behind. But it wasn’t Rangers’ worst performance and they had made the brighter start against a Hyde side struggling for form. Rangers had the first chance of the afternoon on 10 minutes after a poorly taken free kick for Hyde. Ross Daly was dispossessed by Tom Thorley who picked out Joe Cuff wide on the left. Cuff cut in and forced Peter Crook into a parried save. The Hyde keeper repeated the block after Jake Charles was first to the rebound. It was against the run of play that Hyde opened the scoring in the 12th minute. Grant Roberts sent Paddy Lane away on the left and his shot was turned into his own net by Matt Hill. Ten minutes later, it was 2-0. Daly and Lane combined on the left before the former found Roberts some 20 yards out and he fired in to Sivitier’s top left corner. Rangers were still in the match and play was evenly contested but the Boro failed to create any serious openings. At the other end, Dean Smalley headed over from 6 yards out following Roberts’ right-wing cross. Coulson was replaced by Stoke City loanee Sim Thandi a couple of minutes before the interval but, within the minute, Hyde had added a third when a cross-shot from Tom Pratt on the right drifted unchallenged inside the far post. 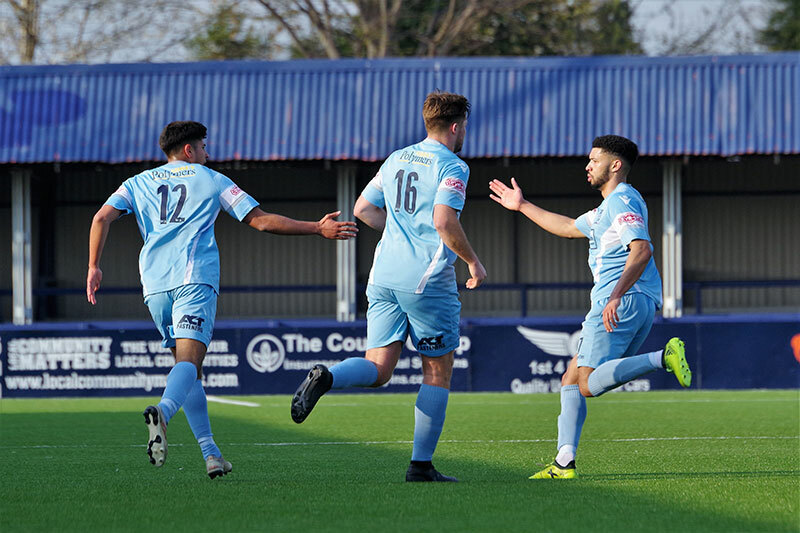 Stafford did most of the pressing in the early stages of the second half but long-range shots from Andy Haworth and Tom Thorley sailed high over the stand behind the Hyde goal. Stafford’s efforts were eventually rewarded when Ben Mills – a half time replacement for Cuff – pulled a goal back on 64 mins. Mills benefitted after Theo Bailey-Jones’ shot from the edge of the area had fallen into his path after striking Charles. Nicky Platt restored Hyde’s three goal advantage when he was left unmarked 20 yards out from where he was able to net his side’s fourth via the underside of the cross bar. Stafford refused to give up and Charles made it 4-2 with a 75th minute penalty after Matty Hughes had handled the initial shot from the Stafford man. A minute later Thandi made it 4-3 with a terrific shot after a good run down the right but Hyde weathered the late Stafford pressure and Adam O’Reilly added a fifth for the home side when he went through on a counter attack.